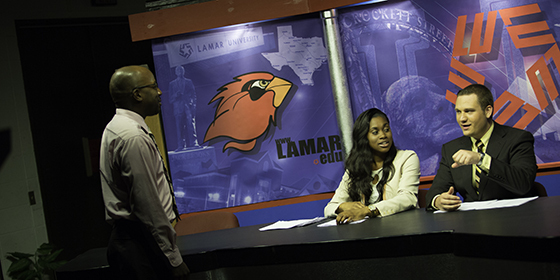 LUTV News is the weekly newscast produced by students in the Department of Communication at Lamar University. Broadcast journalism students are required to pitch, shoot, write, and edit news content for each week’s thirty-minute program. Production is led by student producers, directors, and crew members, which gives students practical news production experience. LUTV News and its news reporters have garnered awards in student and professional competitions from the Texas Intercollegiate Press Association, the Houston Press Club, and the Press Club of Southeast Texas. Former LUTV News talent and production crew members have worked as professionals in a number of television markets across the United States including Austin, Atlanta, Beaumont, Charlotte, Houston, Knoxville, Memphis, New York City, San Antonio, and many more. Previous LUTV News talent and production crew members have also interned and were employed by media companies such as Black Entertainment Television, CNN, Disney, and ESPN. LUTV News is broadcast via Spectrum Cable on LUTV-7 in Beaumont, Texas. For more information on LUTV News, please visit the LUTV Studio in the Theatre Annex Room 116 at Lamar University, email communication@lamar.edu, or call (409) 880-8038. For more information on LUTV News, visit our Facebook page. To view previous work from LUTV News, visit our YouTube channel. For more information on Lamar University Television, please call 409-880-8038.